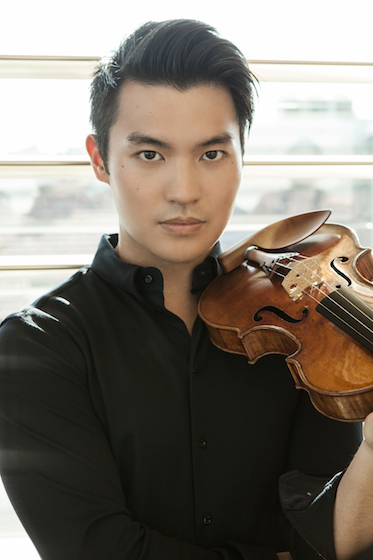 September 7, 2015, 10:17 PM · When it comes to traditional honors, violinist Ray Chen has earned them: he won first prize in both the 2008 Menuhin and the 2009 Queen Elisabeth competitions, has recorded three albums (Mozart Violin Concertos & Sonata; Virtuoso; and Tchaikovsky and Mendelssohn Violin Concertos), gets glowing reviews for his live performances and plays the 1715 “Joachim” Stradivarius, on loan from the Nippon Music Foundation. But he is anything but traditional when it comes to outreach, and his vigorous efforts to reach a young audience stand as a kind of master class on modern communication and social media. First, who would think anyone could explain this fiendish technique so well in less than two minutes? And furthermore, how is it that a pedagogy video about a high-level violin technique would attract some 63,000 views (documented on Facebook, not Youtube), more than 2,000 "likes," and 164 comments? And apparently, enough people sent him video responses that he did an entire video about those responses, as well. Ray was born in Taiwan and raised in Australia, and though a full Australian accent lurks in the background (he let go a few times during our interview), he often speaks English like an American. He also speaks Chinese. He's beginning to catch the attention of an audience that is bigger than the usual classical audience. In addition to what he's done on his social media channels, he did a photo shoot for Vogue magazine in 2013 and has support from Giorgio Armani. More recently, he was featured in July 2015 as The Hottest Violinist Alive on Buzzfeed, one of the more contagious viral websites of the moment. Ray: I had a toy guitar, and I loved playing around with it. One day I decided to put the guitar, this little plastic thing, underneath my chin, and together with a chopstick, pretend to play this new instrument. My parents thought, this is hilarious, it's so cute, why don't we get him a violin? So for my fourth birthday, that's what I got, a violin. I started with Suzuki, with the group lessons, and I really enjoyed that. It was, of course, just a hobby. My parents were always very supportive, but I was lucky to never have an overly pushy mom or dad, when it came to music, which is really important. You have to enjoy it; it's something that has to flow naturally. Certainly you have to work hard and practice long hours, especially when you're older, but I think that people can sense very easily whether or not there's a joy in the playing or if it's all bitterness in the playing. Laurie: So your parents are not musicians? Laurie: But somehow you got on this track where you were doing competitions, how did that happen? I've done competitions ever since I was a kid because I thought they were a great way to have something to aim for, to have a goal. As much as you might want to become the next big violinist or the next big musician, it's very difficult to actually put that into practice without having regular goals. The Australian Musical Examination Board (AMEB) also gave me a constant goal; it's kind of like the English system, you can go Grade 1 through Grade 8 and then after that you have various diplomas. So I did those as well, they were a good thing to keep me in check. Laurie: At 15 you went to Curtis, how did that come about? Ray: My teacher in Sydney, Peter Zhang, was a big advocate for sending students to audition at what he said was the best music school in the world: The Curtis Institute. He had also taught other students who had gone to Curtis, like Susie Park. I thought, okay, I'd better go and check this out! The first time I auditioned, when I was 14, I actually did not get in. Most people don't know this because I guess we don't write on our bio, "Hey, I didn't get in," or "I didn't win this competition." I tell people, "Listen, if you don't get in the first time, just try again, because I didn't get in the first time either." Laurie: But you got in the second time, and studied with Aaron Rosand. It's nice to know, it's not always a straight trajectory for successful artists, you have to keep trying. Failure is a part of it. Ray: I've definitely lost more competitions than I've won. That goes without saying. Laurie: How many competitions have you entered? Ray: I did a few like Michael Hill. I still get e-mails from them and it's so awkward, I want to say, "Yeah, I got eliminated in the first round...Can you please stop sending me stuff?" I'm just joking; actually it was a great learning experience, and I needed it at the time. A couple of times I did a local competition in Philadelphia, during my time at Curtis. And the Philadelphia Orchestra competition, I did that a couple times, never won it. There were a whole bunch of competitions. My first two years at Curtis were really difficult for me and quite unhappy. I was always frustrated, trying to figure out why. You know, when you meet people, and you can't remember names? Or you're reading something and you feel like you're reading the same line again and again? It's like your life is a bit cloudy. That's what it felt like. And then when I turned 18 or 19, something in my mind suddenly cleared. I was able to focus and hear things for the first time; I realized, "Oh my gosh I have to fix this and that." Before, I feel like I was constantly at the grindstone but never actually accumulating anything. That was quite frustrating. It's tough, because you have all these great players around you and there's a lot of pressure. But I guess that pressure was good for me in the end. Laurie: A lot of people think that, when you win a competition, that will just kind of launch your career, but I'm seeing that that doesn't always happen to people. I wondered how it's been for you. In what ways did it launch your career, and what have you had to do on your own, as well? Ray: You're right. I don't know about before, but winning a competition nowadays is just not enough. It certainly opens the doors. But then as the winner, it's up to you. You can use that as a badge of honor to get people pay attention to you, so you do have a boost. But it's what you do in those 15 seconds of fame that really gets you somewhere. Speaking of 15 seconds, now I do these 15-second videos. Laurie: I've seen those, those are really fun, and really funny! Ray: Social media, as you probably know, is incredibly important nowadays. People get paid to do what I do, for my own personal brand as an artist. But I do it myself. I don't have anyone to help me on that, or a team. Growing up around Facebook, it's something that is pretty natural for me to do. It's just like Facebook with friends, but with a larger group of people, on a larger scale. Actually it's easier than trying to convince your friends that you're funny! But that's something that has been an incredible tool for me to get in touch with my audience; to just be out there, on people's minds. Artists, or anyone with a company or personal brand, no longer have to rely on articles written in the newspaper, or hiring billboard. That's all dying. Sure, you could be in a magazine, but you're only there for that issue and then what? You can't be in a magazine every week. But on Facebook, that's somewhere where you can be brought to the attention of people (every day). As long as you provide interesting content, good music, in my case funny videos and photos, you allow people a glimpse into your life and they feel a personal investment towards that. It can become very successful. Laurie: Seems to me you do have to be genuine, you have to be yourself. To find a way to do it that's not just fake. Ray: Right. Relevant and relatable, too. Laurie: You've talked about being a "normal guy," when you have spoken about reaching an audience. What does that mean to you? Ray: That brings me back to growing up in Australia. Australia is quite new to classical music. It's an interesting country because it's definitely a first-world country in terms of infrastructure, but it's still a developing country because it's only 100 years old. Even Canada is a lot older than Australia! You can't compare. We're a very sporty nation, too. Population-wise, we've got less than one-tenth of the American population and only five or six big cities. So when it comes to classical music, it's quite difficult to get a huge classical audience. Growing up, most of my friends were not in that world. There are all these stereotypes of classical musicians, and ever since I was a kid I've been fighting those stereotypes. I've said to myself that I would devote my life to fixing that stereotype, first starting with my mates back at home, then moving on to everybody else in the world. That's something that has been very personal to me. Laurie: Have you had any indications that you've had success in fighting those stereotypes, any instances where you've said, "Yes! Victory!" Ray: Being featured in Buzzfeed, for example. Or when you have a young audience at your shows. I see it on social media: (I have) a young audience. In the analytics, you can see the demographics of your people, the age. It's very obvious. It must be a spur of creativity coming from Brisbane because so far, there are two other entities that have come from Brisbane that have become very popular media: The Violin Channel, and also Two-Set Violin, who are these really funny guys who do funny videos on Youtube and Facebook as well. They started barely a year ago; they've already got more than 30,000 fans. Laurie: What's your theory on that? Ray: I think it's just being relatable. We Australians are just super-chill people. For so long, classical music has been (perceived as) uptight, reserved and conservative. Finally with the Internet, it is connecting everyone and also connecting all fields, allowing people to see the bigger picture. People might have been in a bubble before, but (the Internet is) expanding their vision. Classical music needs to be more engaging; we can't just keep thinking that the audience is going to come to us. If you say to someone who never grew up around classical music, "Hey, would you like a subscription to the New York Phil?" They're going to wonder, what can that do for me? You need to give people a chance, at least, to first have a go with your product, have a test drive. There are people in the industry who don't see it as their responsibility to gather new audiences; I don't know what to say to them. Maybe right now you can still do that. You've got people who are still from the last generation who are still alive, musicians and audience. But the next generation -- good luck with that. In a few short years, everyone is going to be Internet savvy. Laurie: Do you find, through the Internet, that you're able interest young people in what you're doing, and in live performance? Ray: Absolutely. Because first you need to get their attention. It's a lot like going to a movie. First, you have to have the trailer. Have you ever been to see a movie that you didn't know a single thing about it? No. That's like telling someone off the street, "Hey, do you want to go see the Philadelphia Orchestra?" It's so unrelatable, the person would be like, "What the heck? That has nothing to do with my life, I don't even know who's playing!" You might go to a movie if you knew your favorite actor or actress is in it, or if you knew your favorite director was doing it, or if you had seen the trailer. We can emulate this in classical music, give people a personal investment in the product. You need to give people a reason to come to live classical concerts, and that reason could be their favorite musician is playing, or their favorite orchestra, or their favorite piece, or favorite program -- things like that. Laurie: Tell me a little bit about playing in Paris on Bastille Day last summer, with Daniele Gatti and the Orchestre National de France. What a huge event, and it was televised! A little bit of a crazy environment, too. Ray: To be perfectly honest I had no idea it would be that crazy. There were other artists there, like Lang-Lang, cellist, Gautier Capuçon, and four singers. You have these big heavyweight names on the roster, and then there's me. When they asked, I said "Sure, I would love to do this!" Then they said, "Oh by the way, we're projecting 800,000 people." And I thought, "Wow. Good thing I've practiced!" I was so happy to see that Paris chose a classical concert for this event. There was no other concert there that day. There was no rock concert, there was no pop concert. It's a day like our July 4th, and this is what they chose. It's what they choose every year, always a classical concert. Sure, we're playing popular pieces, but still, it's completely classical. And that's something really special. Laurie: A violin geek question: Do you use a shoulder rest? Ray: I used to not use one, but now I do. It's a custom-made shoulder rest. I worked on it with a friend of mine in Chile, and actually it's still in the works, we're still fiddling around with it and adjusting it. Who knows, maybe one day we'll sell it! It doesn't clamp on the sides of the instrument; it's actually stuck the back of the instrument with a special type of glue that doesn't harm the varnish. I play a Strad, so I'd be killed if it harmed the varnish! I tested it on various instruments before the Strad, and then I got the Foundation's approval. It's completely safe; I mean you could eat this glue, and it would be okay. You take the shoulder rest off, each session, and you put these little covers on it, to protect it. The next day, you're ready to go. You re-apply the glue every three to four weeks, a little coating. Laurie: What made you decide you wanted to do that? Ray: The sound. You couldn't beat the sound. The no-shoulder-rest has the intimacy of sound, but projection gets killed. Common shoulder rests have projection but have no intimacy. But this, this has both. Laurie: The intimacy meaning that you're touching the violin? Ray: The intimacy of a tone. When you listen to the tone, you feel emotion more easily; you can hear it. Whereas with a shoulder rest, something about that angle and the fact that it's clamped on the sides, I don't know. The sound sounds really hollow. I've done a lot of tests, and that's just my opinion. I'm not trying to sell you the product! But I personally believe that, and that's why I use that. Laurie: People just talk about this subject so much, they get in big enormous fights about it, too. Ray: Yes, because all the old-school people played without shoulder rests. I was such an advocate for no shoulder rests and suddenly I'm here, using this thing which is very unusual. It's not a common shoulder rest, it's much lower and it's made with wood, there's more plastic, no rubber on it. It's flat, a piece of wood in a special shape. Laurie: Do you have any projects coming up? Ray: These days I'm trying to be more selective in the next recording that I do. I don't want to just record another concerto that's already overdone; I want my next one to be something a little more special. I'm performing a lot of Brahms Violin Concerto these days because the violin I'm playing is the Joachim Stradivarius, made in 1715. The instrument sounds just unbelievable, probably the best Strad I've played on. I also like playing my modern instrument, too, and I like to switch between the two. I'm pleased to say, people don't know when I'm playing which! Laurie: Who made your modern? Ray: His name is Kurt Widenhouse. He lives up in North Carolina. American. I'm playing on one that was made in 2008, and it sounds really good right now, the best modern instrument I've played. I enjoy taking it on tour, just to give the Strad a rest. It's a challenge and when I successfully play it and people say, "Wow, your violin sounds amazing!" Then they ask "What is it?" I have two options, if they're a musician I tend to tell them the truth, if not I tend to tell them, "It's a Strad!" or sometimes when they're musicians I say, "It's a Strad!" and they say, "I knew it!" (he laughs) People listen with their eyes, most of the time, so, you start to figure that out. September 8, 2015 at 10:11 PM · Ray Chen seems like such a great guy and, of course, he sure can play the violin. I noticed that in his upbow staccato video he is not using a shoulder rest -- maybe it's the newfangled glue-on device that he mentioned that we can't see. But in the youtube of his performance of the Mendelssohn E Minor earlier this year (28 Feb 2015) he is using one -- with conventional rib clamps. And thanks, Ray, for admitting that you like airplane food. I do too. September 8, 2015 at 11:41 PM · When you've worked 6 hrs straight to put a presentation together, jumped in the car, driven 4.5 hrs through Throg's Neck Hell to JFK, run as fast as humanly possible through customs, barely made the plane, sat on the tarmac for 2.5 hrs awaiting thunderstorms and finally taken off at 9:20 bound for some godforsaken place, airplane food tastes soooo gooood! September 9, 2015 at 07:28 PM · What a refreshing article! September 9, 2015 at 10:38 PM · His video is beyond funny. I loved it!